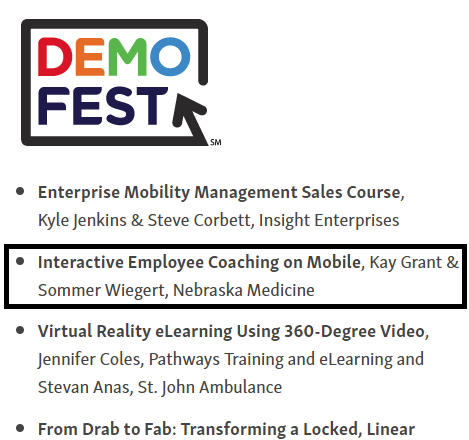 Participating in DemoFest was one of the highlights of my career as an instructional designer. It started with an idea - using a software called xapiapps to perform employee coaching at the moment of observation by utilizing mobile devices. 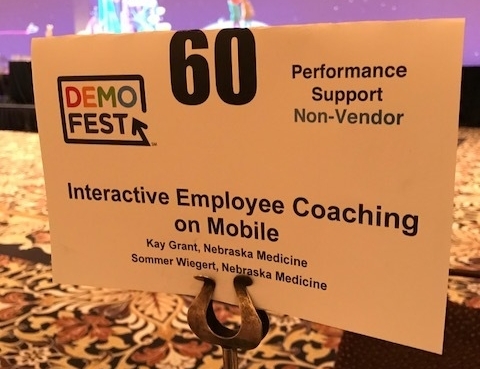 Coaching this way created the most impact by removing the stigma of coaching as punitive by utilizing an interactive app, automating follow-up for both the coach and employee, and by keeping it informal and on-the-go. I spoke non-stop for two hours sharing our lessons learned from the pilot test with hundreds of my industry colleagues. I answered questions and told stories of success and failure. While we did not win our category award, I fell in love with the whole experience. It made me realize how important it was to give back by adding to the innovation and growth of our industry. I can't wait to do it again! 2017 DevLearn DemoFest Participant, Las Vegas NV. "Interactive Employee Coaching on Mobile"
Instructional design changes constantly. Technology moves faster than most of us can keep up. 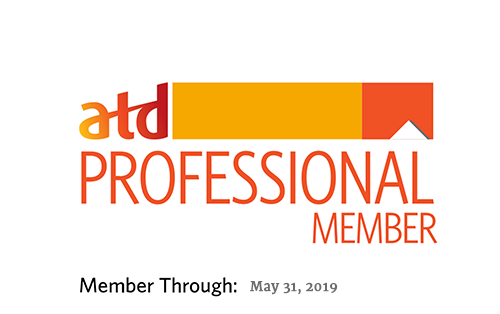 I believe that as educators, designers, and developers, we must constantly be building our own toolbox, and experimenting with new applications, tools, and techniques. With that in mind, this is my personal roadmap of skill development I'm currently building on or will be within the next calendar year. I love learning and I love experimenting with new software, so this list is ever-changing. The list is in the order of personal importance. After the amazing experience of presenting an adult learning project and new technology at the DevLearn conference in 2017, I will also be pursuing presenting and competing more in 2018 and 2019 and publishing articles on instructional design and learning.